Nearly 70 years after being held at an internment camp in China during World War II, Col. Jack Graham III found himself riveted by a 2010 cover story in Record magazine. 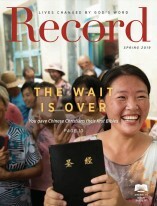 The story featured the new Miao Bible translation and transported Jack back to his childhood in China, where his parents and grandparents served as missionaries. Their pioneering translation work in developing a written language for the Miao people is now bearing fruit. He was overjoyed to read about the many lives being changed by this translation — the very one for which his family had laid sacrificial groundwork. Jack remembers Liddell operating one of the prison kitchens. Though Liddell had a hard job feeding the prisoners, he found time to work with the children — keeping them busy and distracted with stories and games. Sadly, Liddell died at that camp at age 43 of a brain tumor, only five months before the war ended. News of the Miao Bible translation brought to mind better memories of Jack's time in China. Out of the joy of this personal connection, Jack has made a generous gift to American Bible Society. Today, Jack and his wife Gerry make their home in Missouri. On Dec. 6, 2011, the 70th anniversary of Pearl Harbor Day, Col. Jack Graham III will celebrate his 80th birthday. A ministry partner is bringing God's Word to his home country via Scripture translation projects. For more than 50 years, American Bible Society has proclaimed the eternal hope of God’s Word in the everyday language of modern society.